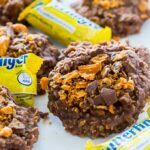 No-Bake Butterfinger Oatmeal Cookies are so simple to make with lots of chocolate, peanut butter, and butterfinger flavor. These cookies are similar to No-Bake Chocolate Oatmeal Cookies, but the flavor is kicked up a notch with crushed candy. Place butter, cocoa powder, sugar, and milk in a large saucepan. Heat over medium heat. Bring to a boil and boil, stirring frquently for 90 seconds. Remove from heat and stir in peanut butter, oats, and vanilla. Once thoroughly mixed, stir in the butterfingers. Use a 1/4 cup measuring cup to drop mixture onto a parchment paper-lined baking sheet. Sprinkle with crushed butterfingers. You can use either quick-ccokingnoats or old-fashioned oats. If you use old-fashioned, the texture will be a little chewier and the cookies will have slightly more oatmeal flavor.